In this blog for World Mental Health Day, Dr Praveetha Patalay examines the factors that influence children’s mental illness and wellbeing using the Millennium Cohort Study. If I asked you what makes a child happy, one possible answer would be the opposite of what makes them sad. This would be considered a non-controversial response. The intuitive assumption when considering subjective wellbeing and psychological distress is that factors associated with one are associated with the other – albeit in the opposite direction. But what if we’re wrong? What if wellbeing and mental illness, or happy and sad, are not two sides of the same mental health coin? We set out to investigate this question using data from more than 12,000 children born across the UK in 2000-01 who are taking part in the Millennium Cohort Study (MCS). Our findings show that in children, it is sometimes the case that factors affecting mental illness also affect wellbeing (see common area in centre of the diagram above), for example, being in a single parent household, having problems getting along with peers, arguing with parents and experiencing sibling bullying are all associated with greater symptoms of distress and lower wellbeing. However, as can be seen from the areas on the left and right sides of the diagram, many things associated with psychological distress are different from those associated with wellbeing. Let’s first consider some of the risk factors unique to mental illness (on the left hand side of the diagram): here we see that having siblings, lower family income and chronic illness are associated with having greater symptoms of ill health. However, these factors don’t seem to be associated with children’s subjective wellbeing. 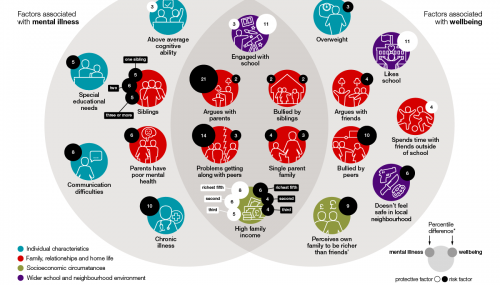 Instead, children being overweight, having arguments with friends, perceiving their neighbourhoods as being unsafe, and perceived inequality (richer than their friends) are all associated with lower wellbeing (on the right hand side of the diagram). Some findings were unexpected. For example, children who perceived themselves as being richer than their friends reported lower wellbeing. Children with chronic illnesses (such as asthma and diabetes) did not report lower wellbeing than their peers. Also, we observed a reverse income gradient in wellbeing to the one observed for mental illness (in the middle area of the figure), whereby higher household income was associated with lower wellbeing when compared to children from lower income households. The MCS data are well-suited to this investigation, as we can include in our analysis factors right from the birth of the child as well as obtain estimates that are generalizable to the UK population. 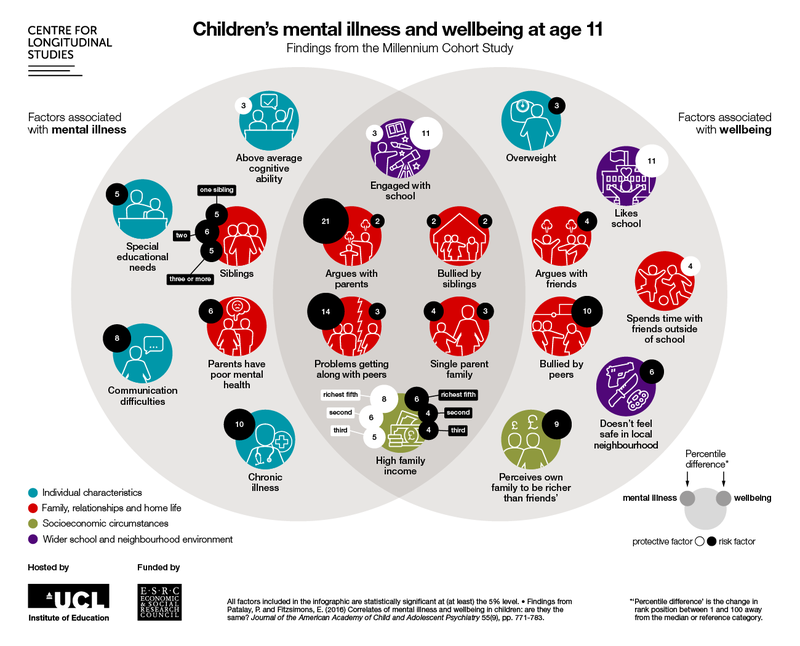 Importantly, the MCS includes both measures of mental ill-health and wellbeing, which allowed us to compare in the same children how different factors were related to both these domains. An important element is the size of the association (represented in the black or white bubbles above each factor in the diagram). We present the extent of the relevance of each factor in terms of the percentile change they predict at the centre of the distribution of responses. The number in each bubble represents the percentage point difference that the factor makes to mental health or wellbeing. For instance, consider a risk factor (represented by black bubbles) – being bullied by peers risks lowering children’s wellbeing ranking in the distribution by an average of 10 places from the median. Some are protective factors (represented by white bubbles in the diagram) – for instance, having above average cognitive ability seems to reduce a child’s rank position in terms of mental ill-health by three places from the median rank. If we consider the relative size of the impact of different factors, we can see that parent reported arguments with the child and problems with peers have the largest influence on their mental ill-health, followed by chronic illness and communication difficulties. Being bullied, school engagement and perceived neighbourhood safety have large impacts on children’s wellbeing. Even when looking at the common factors in the middle area of the figure that are associated with both outcomes, we see that some factors have a much stronger association with one or the other outcome, for instance, arguing with parents predicts a 21 percentile score difference in mental illness and comparatively only 2 percentile points in wellbeing, representing a negative effect that is ten times greater in terms of its impact on mental illness. Another relevant consideration in this research is who reports the children’s psychological distress and wellbeing. Children’s subjective wellbeing was assessed by asking them to rate how happy they were with six key domains in their life, including their family, school, peers and appearance. On the other hand, the symptoms of mental illness were reported by their parents, who responded to questions about the emotional and behavioural symptoms their children were experiencing. Similarly, the correlates included in the study are from various sources including official records, parents and children. Asking children for their own assessment of their mental health is important as they provide a unique perspective on their own health and when asked appropriately they are able reporters of their psychological distress and wellbeing. For instance, children’s own reports of their mental ill-health (if assessed) might have been more strongly associated with their experience of being bullied by their peers – something we do not observe here in the parent reported symptoms. The study is published here, where details of the measures used, analysis and results can be found along with discussions about possible bias introduced by the different reporters in the two domains, the importance of considering the child’s own views on their symptoms and the implications of the findings for policy and practice in child mental health. We also hope our study highlights the importance of including wellbeing as an outcome in the evaluation of interventions and policies. Reducing symptoms of mental illness is not where our interest in mental health should stop if we want children and society to not just be not unhappy, but to actually flourish and lead happy, meaningful lives.